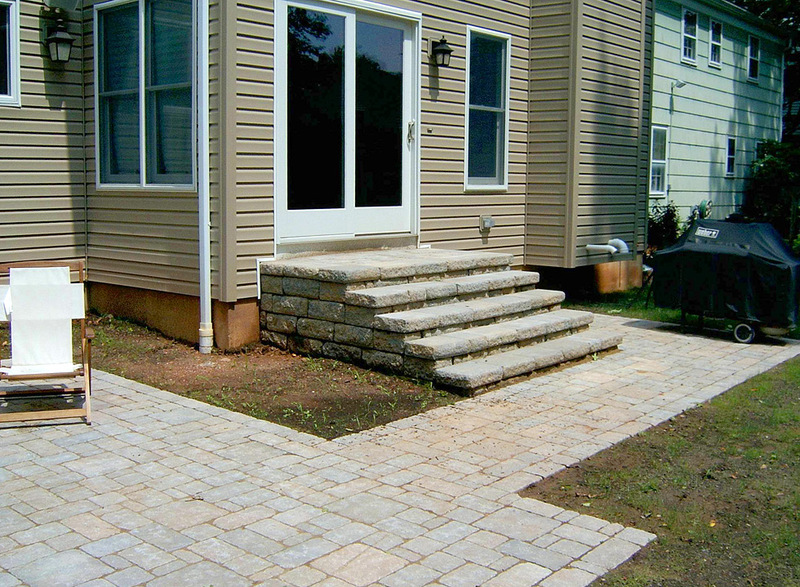 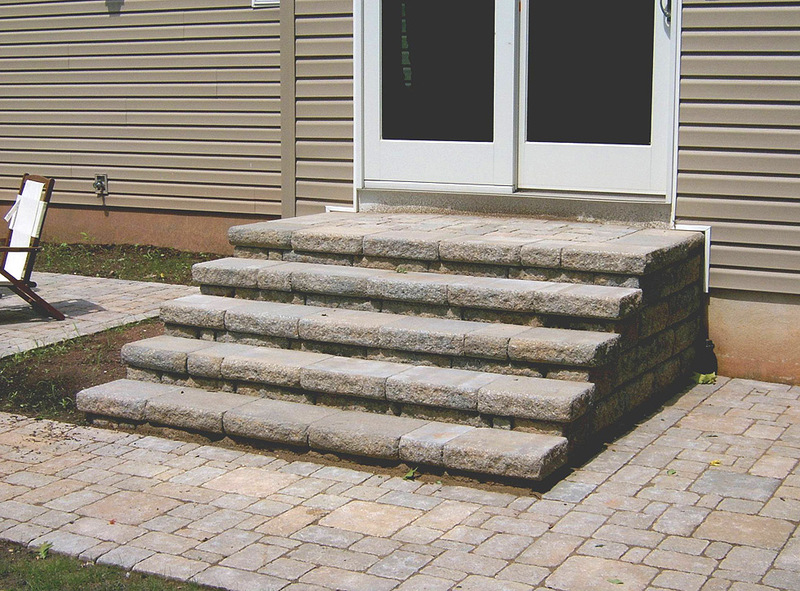 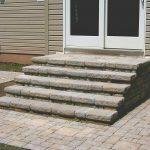 A newly built home required a patio and stairs to match. 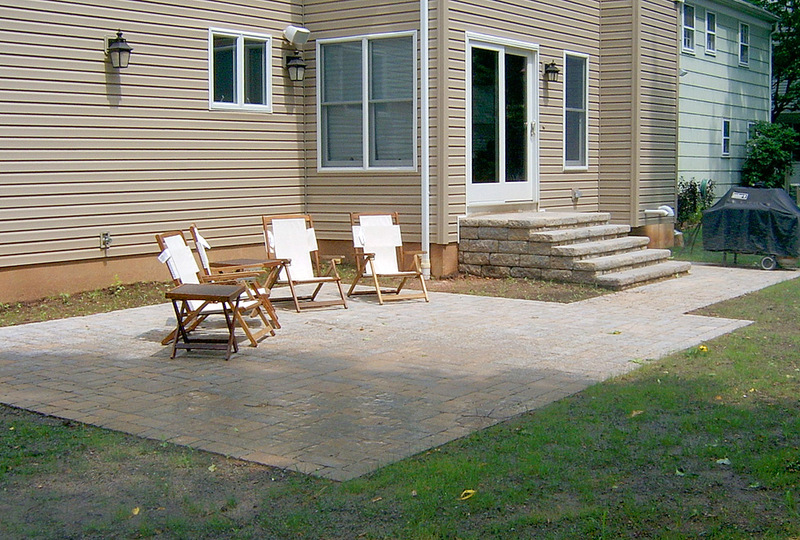 First we finalized the layout & pattern of the new patio & staircase with the client. 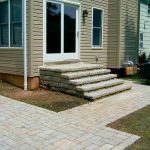 We then removed the small wooden staircase & excavated to the proper depth to ensure a quality installation that will last a lifetime. 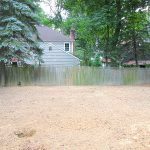 A tamped QP base underlined with soil stabilization fabric, topped with a layer of concrete sand to lay the pavers on was then put down. 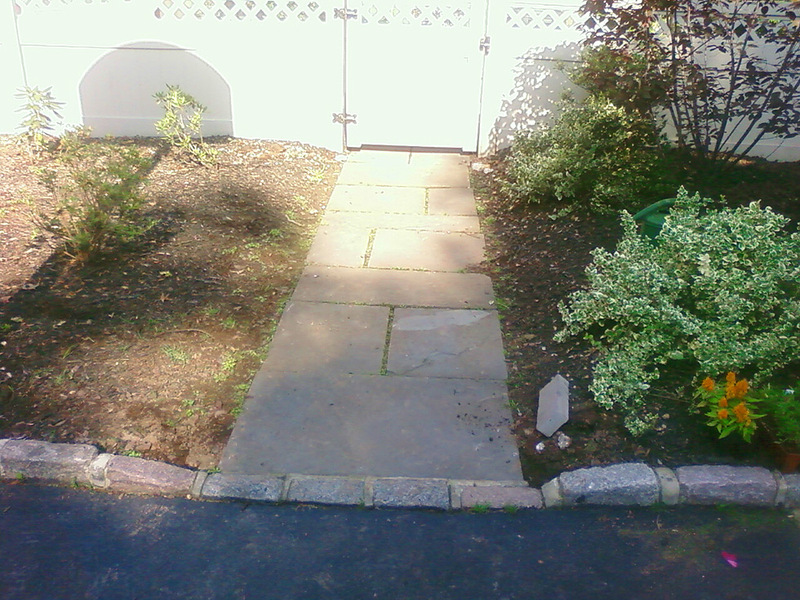 Lines were marked and the steps and the pavers went in. 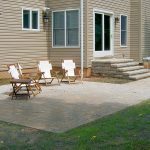 After repairing the siding, re-grading around the patio for a future planting, the steps were ready for the handrail to complete the job. 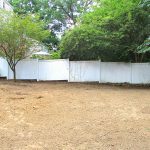 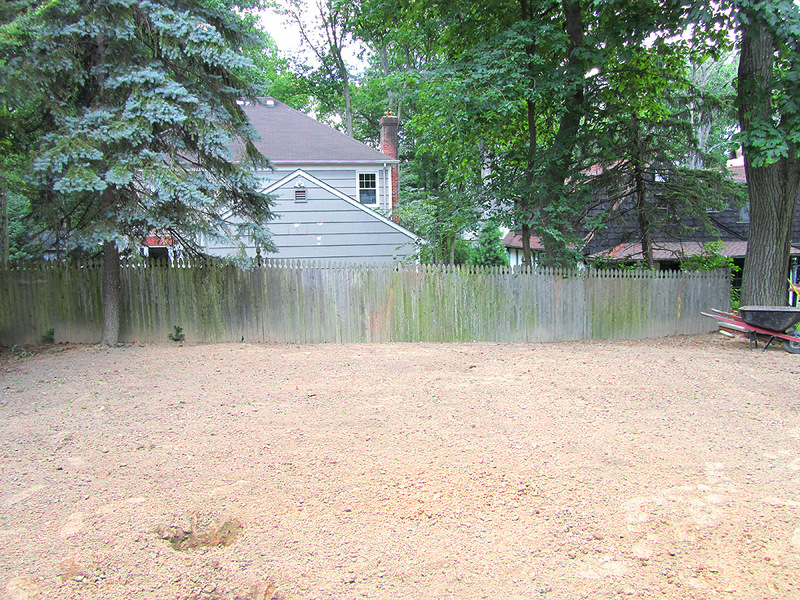 We began this job by removing debris and re-grading after a completed construction project. 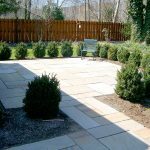 Once again we worked with the client to come up with a selection of plants which best suited the client and complimented the site. 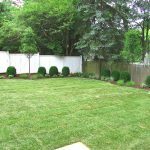 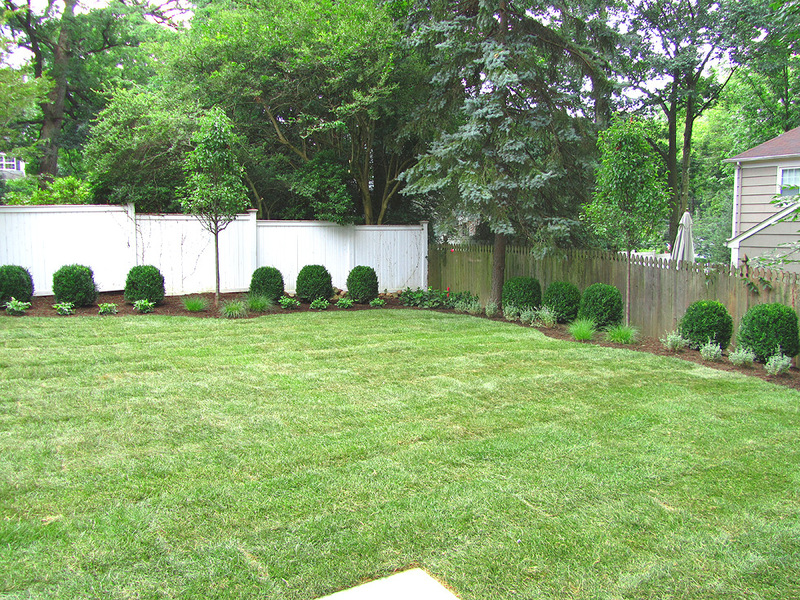 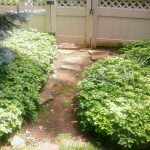 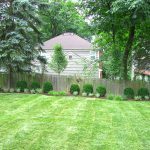 This client chose sod, which would instantly transform the yard after being laid. 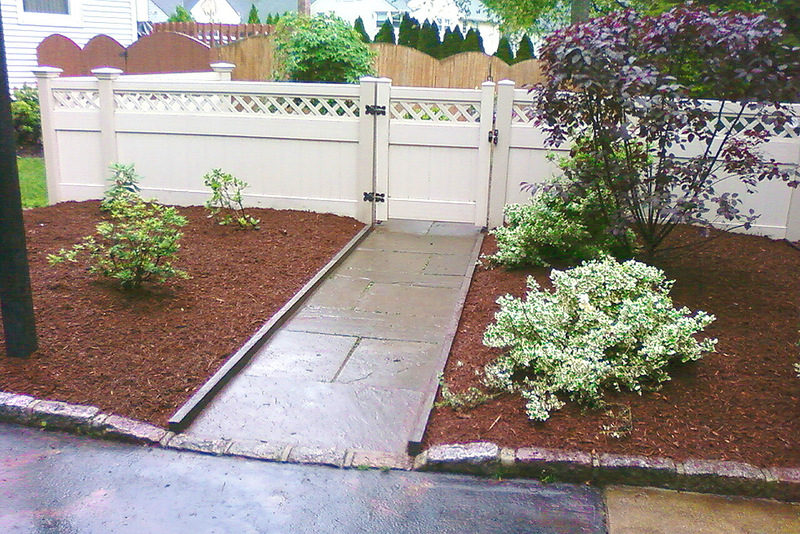 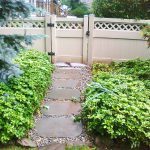 Walking up to & through this gate, is strikingly different after this makeover. 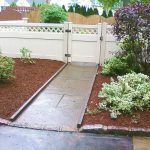 The one entrance had a problem of mulch always making it’s way to the walk. 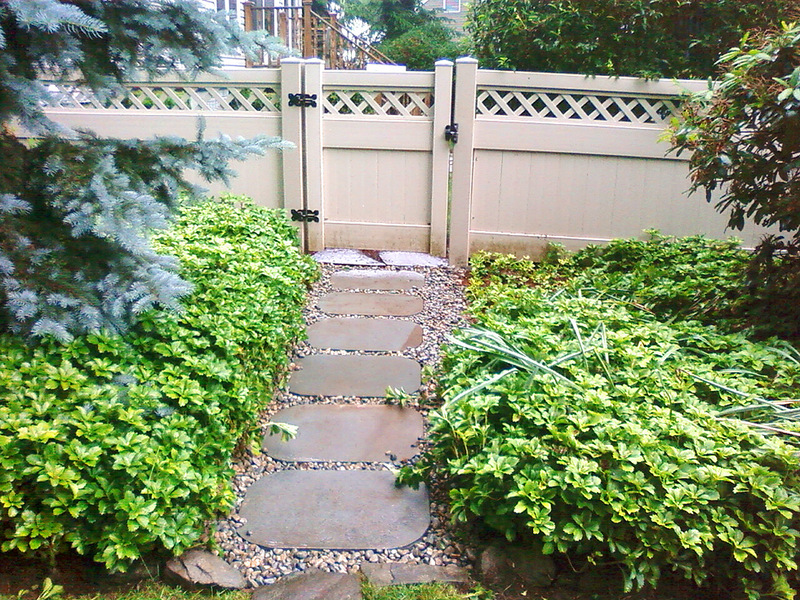 Our solution this was custom cut bluestone pieces installed to retain the Hemlock mulch in the beds. 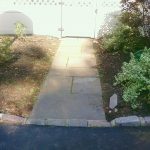 The other entrance was brought back to life with new special cut bluestone stepping stone walk, surrounded by new river bed stone. 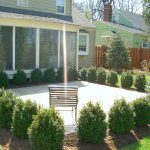 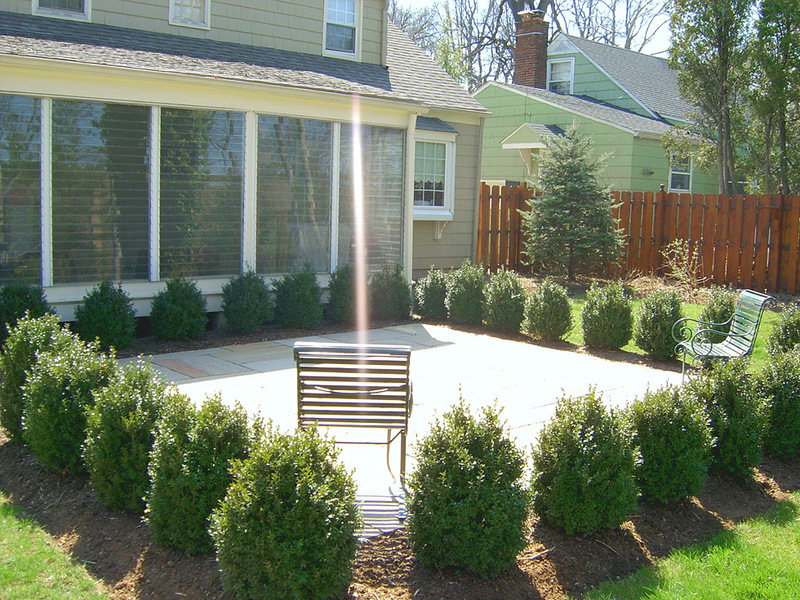 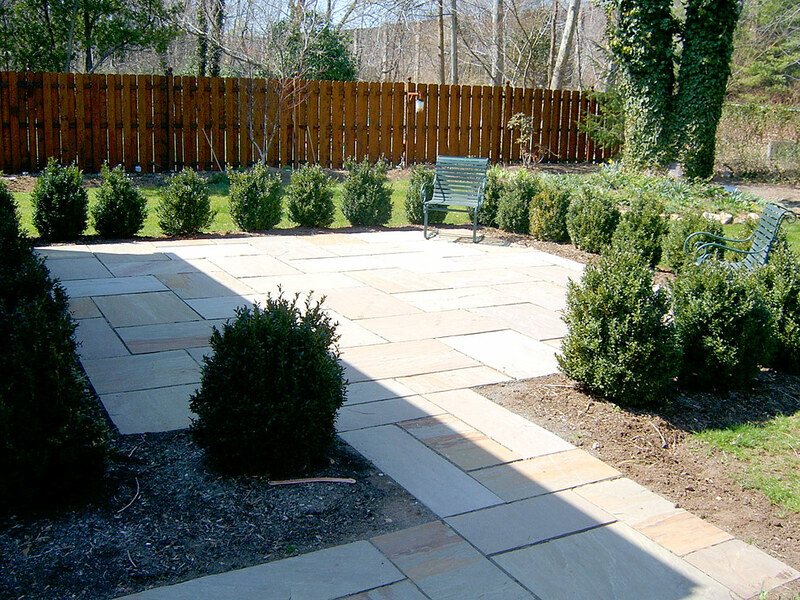 The goal of this project was to install a Bronte stone patio and enclose it in plants. 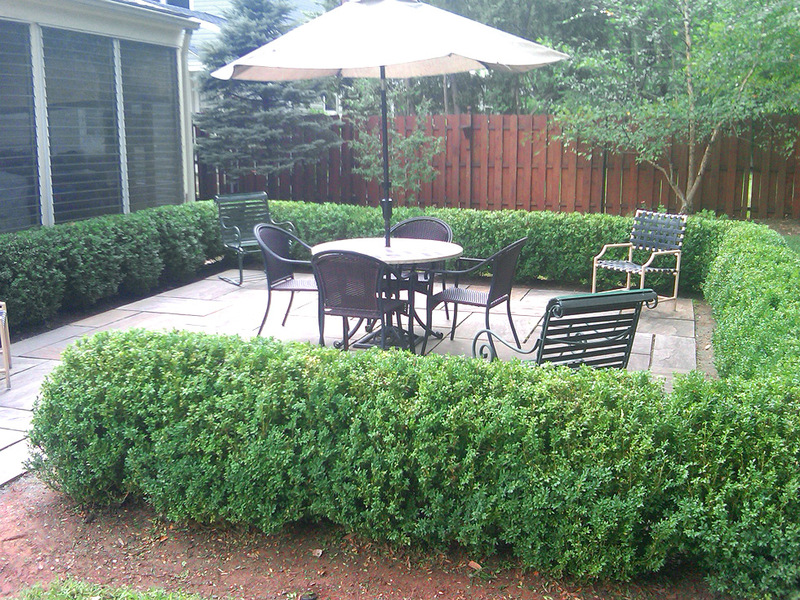 We choose to install Boxwoods, strategically spaced to create a wall of plants. 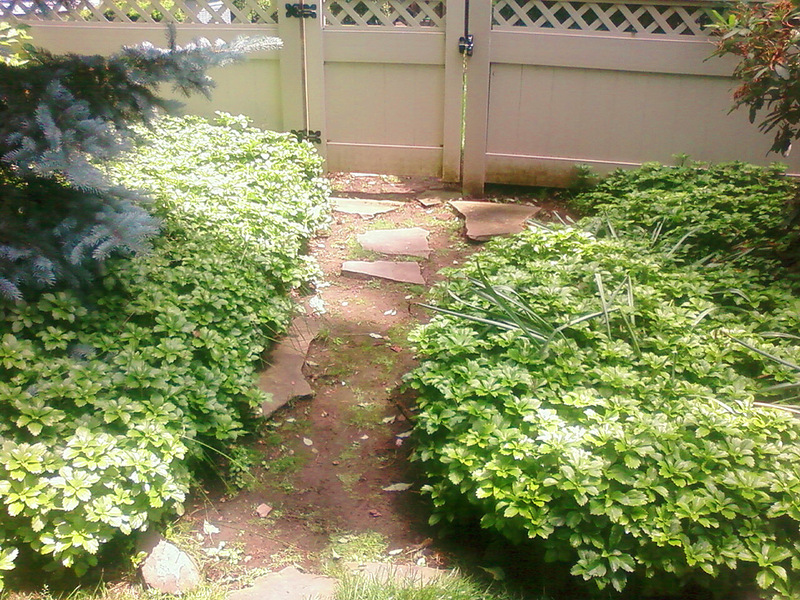 The plants would take a few seasons to completely come together. 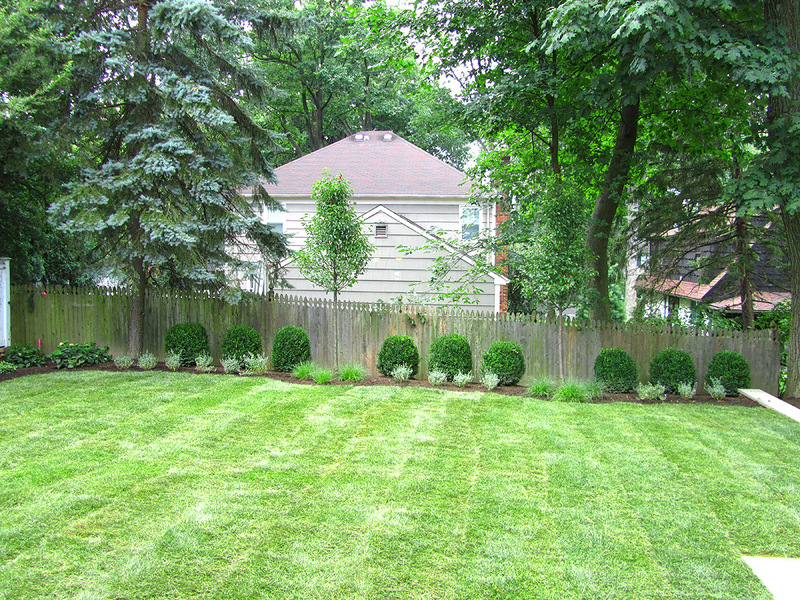 As the plants grew together, we periodically paid a visit to trim the plants with the proper pruning techniques needed to accomplish our goal. 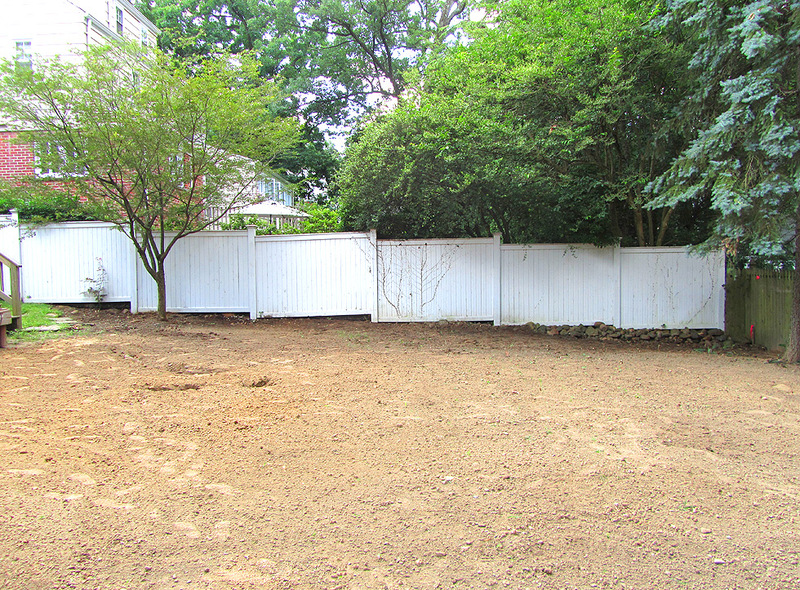 Finally, the patio was enclosed, and the wall of plants was complete. 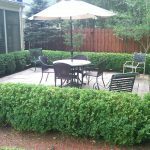 We will continue to prune these plants in a manner which will allow us to maintain this desired looked and ensure a healthy plant for years to come.